In the previous blog, we discussed the basic concepts behind vehicle detection using magnetometers. This week, we will discuss more about the ideal sensor placements and some of the hurdles faced with vehicle detection accuracy. The intensity of the measured flux line density, or field strength, decreases with an increase in distance between the sensor and the vehicle. This would result in a very weak signal that is hard for event detection and analysis. So, the effective placement of the sensor relative to the car surface is an important point to consider. Mounting the sensor on the road (near the surface) is the most common and effective method, as shown in figure 1. It is used to detect vehicle presence as the underneath of the car has the highest metallic concentration. The next ideal location could be on top of a 2.5 foot pole at the side of the lane with an optimal distance between the pole and the moving vehicle of 1 to 2 feet. From the corresponding signature profiles, we can see that placing the sensor on the road surface obtains a signal profile with higher magnetic field strength change. 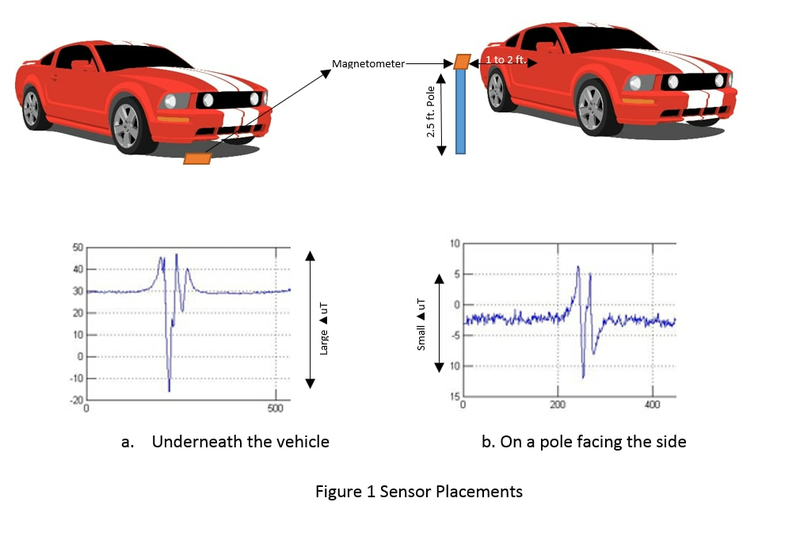 Figure 2 shows how increasing the distance between the sensor and car will have impact on the measured signal strength. OK! Now that we know the basic concept around vehicle sensing, let’s use a simple threshold based detection method to detect vehicle presence. i.e. if the RMS value (all X, Y and Z axis) of the measured signal is greater than a user defined threshold, then a vehicle is determined to be present/passed and vice versa. However though this may seem pretty straightforward, in certain critical scenarios it might produce a false positive/false negative trigger. Considering the class of vehicles according to size- ranging from bikes to trucks- the amount of ferrous metal interacting with the earth’s field would vary. Therefore, the measured change in signal strength would vary. Hence a common threshold of activation would not be a good solution to detect all classes of vehicles. Also the sensor’s baseline signal (i.e. under zero flux field) varies slightly with temperature. This change in offset, due to temperature change, might lead to false triggers. Hence instead of just using threshold based detection, pattern recognition techniques can be used to understand the signature. This will help obtain meaningful time or frequency domain features like mean, standard deviation, correlation between various axes, min/max values etc. Initially, a trained model can be built by obtaining signatures of different class of vehicles (according to size). The efficiency of this trained pattern recognition model will depend on the size of the training set. Thus, irrespective of the operating conditions, the pattern recognition model will help us identify vehicle presence effectively by closely analyzing the signature. 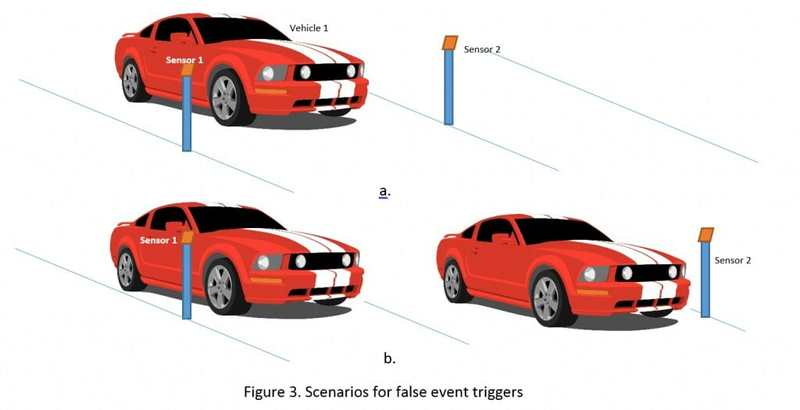 Another common and obvious hurdle is how to prevent false triggers in a scenario as shown in figure 3a. Will sensor 2 sense vehicle No.1‘s presence? How do we account for it and prevent false triggers from adjacent lanes? We can place the sensors at the extremities of the lanes as shown in the figure 3b. But it’s quite tricky for a multi-lane road. So, one quick way is to magnetically shield the rear part of the sensors (in this case sensor2), this would reduce the amplitude of the field strength caused by Vehicle 1 on sensor 2. So, if the amplitude of signal change measured by sensor 1 (as the vehicle passes through) is greater than the signal change measured by sensor2, then the car is actually in lane 1 rather than 2. In the next series we can identify some of the potential use cases and applications apart from mere vehicle detection using magnetometers. In the meantime, please visit our webpages to learn more about our magnetometer offering. What is the best way to detect the presence of car in parked slot? I’m thinking about IR sensors. Is it best choice?